Taste - The sensation of water-soluble compounds in coffee through taste buds (nerve endings) on the tongue. Taste receptors - Nerve endings on the tongue (taste buds) that respond to sweet, salt, sour, and bitter stimulations. Thermal container - A container that maintains the temperature of brewed coffee without direct heat. Tobacco - This aroma descriptor is reminiscent of the odor and taste of tobacco but should not be used for burnt tobacco. Triglycerides - Chemical compounds that are used as a decaffeination agent. Turbulence - The agitation of the grounds in the coffee bed during the brew cycle, created by the spray pattern, rate of water flow, and configuration of the brew basket. 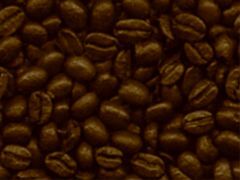 Vienna Roast - Dark brown color with small amounts of oil roast on the bean surface; has a noticeable dark roast (burnt/smoky) and sometimes chocolate-like flavor. Viscosity - In coffee evaluation, the resistance of internal flow in the brew because of oily material suspended in the fluid. Water bypass - A mechanical device that diverts a portion of the water in a brew cycle directly into the brew holding chamber instead of allowing it to pass through the bed of chlorination Adding chlorine to water to destroy disease bearing pathogens. Water filtration - The removal of chemical substances from water by filtration, usually through a bed of activated carbon. Water hardness - The amount of dissolved minerals in ordinary water, ranging from 50 parts per million (ppm) to 800 ppm in most municipal water supplies. Water quality - The degree to which water contains the desired level of mineral hardness, dissolved oxygen, and absence of any chemical contaminants. Water softening - The substitution of sodium ions for ions of dissolved minerals (hardness) found in water. Wet (washed) method - One of two methods of processing coffee berries. First, the cherry pulp is removed through pulpers flushed with water; next the coffee is fermented to remove the slippery mucilage coating around the parchment; last, the coffee is dried in the sun on patios or in mechanical dryers. Wetting - The absorption of water molecules by ground coffee, which enables the extraction of soluble flavoring materials. Winey - This terms is used to describe the combined sensation of smell, taste and mouthfeel experiences when drinking wine. It is generally perceived when a strong acidic or fruity note is found. Tasters should be cautioned not to apply this term to a sour of fermented flavor. Wondering how much coffee to buy or how long it will last? Click here to download our free Coffee Calculator© now.